This is electrically operated version of the manual press. The pumping is done by gearmotor drive. Simply press a button & it will start building pressure & will stop autom- atically at set pressure by means of a pressure switch. 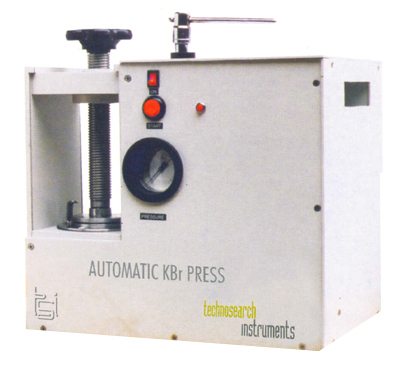 KBr Press Model AP-20, Oil Bottles-2 Nos., Safety Sheets-2 Nos., Allen Key for pressure Adjustment. Higher capacity press with larger plate size are available for specific applications. Ask for specifications giving details of your requirement.